Q: Are Container Strawberries Perennial? 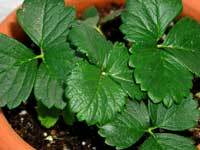 Answer to: Are Container Strawberries Perennial? As long as you take proper care of them, they will come back. You should not have to replant them. The number of berries you get depends on the amount of nutrients the strawberry plants get. If they are tightly packed in a container, they won’t do well. If they are in good soil with appropriate water, they will produce just about as well as any other planting modality. Will my plants survive a cold winter in their store planted pots? I want to transplant them into the ground but I don’t want to risk killing them. If you provide them with enough insulation and don’t allow the soil to dry out, the potted plants should survive the winter. If you want to transplant them into the ground, I’d recommend doing so in the fall. That is typically the best time to transplant. Good luck! Yes, they can, but you will need to cover them with a liberal application of clean straw to protect them over the winter months. Good luck! I came across your site and have learned so much from it. THANK YOU! One thing I couldn’t find though, where do I put my potted strawberries in the winter if I don’t have an attached garage? I do have a garage, but not attached. I have a basement,but that’s heated. Any ideas?? If you aren’t in a Zone where the temperatures drop too cold, you can safely keep the plants outside up against a heated wall of the house. You can also place them in a root cellar or other equivalent space, just be sure to water them! Good luck! I got strawberry plants from Oklahoma, I live in Minnesota, can I plant them in containers and can they stay outside thru our harsh winters? Do I need to cover them or protect them in any way? You can plant them in containers, but you will need to give them extra protection where you live. See this for more info! Good luck! Great site! I’m trying to teach my little girl about gardening, and strawberries are a great choice for a kid – but we live in a townhouse. My only outside area is the front stoop, in front of which is a city bus stop. These kids were pretty good about leaving our tomatoes alone last year, but I don’t know that they will be able to help themselves with strawberries – so we are growing them indoors. Would appreciate any advice you have for this particular arrangement. We already know to have grow lights on them during the day, and when we’re ready to fruit, we’ll need to “do the deed” for the bees with a little brush. They’re evies (day neutral), which seems like it should be a good choice for indoors. We got them as roots, sprouted them in water, then transplanted three of them into a 3′ x 1′ box. What else do I need to know? You are off to a great start! Even though you’ll be growing indoors, I’d recommend reading the Growing Strawberries reference page. Adapt as many of the principles for indoor use as possible for best results. Good luck! Mild winter and the plants never fully died off, I still see a lot of leaves etc. it even looks like there is new growth already?! Is this strange for end of March? My question is do I cut all the leaves down to just the new growth? Or do I do anything at all? So far I’ve removed some of the dead crunchy leaves and vines and left everything else, thanks! I would remove any dead leaves and leaves that are damaged. The new growth should suffice to produce a good crop! Good luck! Should I cut the plant back in winter? You don’t have to cut the plants back in winter. Once the cold weather hits, the plants should enter dormancy, and the vegetative material will die back to the crown. When that happens, gently remove or rake it away to prevent fungal infections. Good luck! As you know, when you plant one strawberry plant in a container, it expands by producing new plants around it( not stolons), and sometimes the container gets full. For this particular plant, Its like the soil is no longer enough for the plant. Even the water requirements have gone high. How can i reduce the plant in the container without hurting it? You are correct: mature strawberry plants often multiply their crowns. You can either divide and replant the crowns in their own containers, or you can choose one that looks to be particularly healthy and vigorous and re-plant in your pot while discarding the rest. Good luck! IF I plant strawberrys outside on my yard, will the birds eat the fruit? If the strawberries aren’t protected, and the birds find them, yes. Even wild critters love strawberries! Thank you for answering my question. I think I just found out why my strawberry fruits are weird and sour. I found a small hole on a leave this morning. That’s an indication of spider mites manifestation. Upon a closer look, the other leaves have indents on them too. The leaves are still green and none has fallen off yet. Do you think it can be saved? Or I should just throw out the plant and start again next year? And for my fertilizer (18-18-21), is there anything that I can do to make the concentration right for strawberry plants? I don’t want to just throw the whole box out. Yes, you should be able to save the plants. See here for help, and you can try a liberal application of diatomaceous earth to see if that will work. As for the fertilizer, I am not sure how to modify the concentrations of the nitrogen, potassium, and phosphorus. But, they do sell strawberry-specific fertilizers at most garden stores and co-ops. Good luck! Possibly. Strawberries prefer 10-10-10, but you need to apply it at appropriate times. 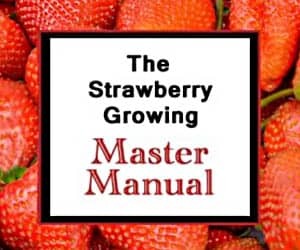 I’d recommend reviewing the information on the Growing Strawberries reference page. Also, there are several reasons why strawberry plants don’t produce well. Good luck! I am from western Massachusetts winter this year came in like a lamb and left like a lion. I had a couple of strawberry plants in the front lawn and let them be. Can you believe they survived and already have new growth. I’m pretty excited, yes, this is exciting lol. My question is what now? Do I add fertilizer? What do I do? Yes, I can believe it! Strawberries are very hardy, although they can be damaged by extreme cold. For help, see the growing strawberries page, and good luck! I have 2 plants in clay pots and I live in Iowa. do I need to take these inside for the winter? Our garage is heated, but just enough to take the chill off. Should I take them in there? Also, do I need to water them all winter? Yes, you should take precautions with your strawberries to ensure they survive the winter. Taking them into the garage is a good option, and they do need to be watered to keep them from drying out and dying from dehydration. I’d recommend reviewing the posts on overwintering strawberries for more information. Good luck! Can one grow June bearing plants and Everbearing plants in the same pot/container? I just ordered both and wondering what my options are. Yes, you can grow both everbearing and June-bearing plants in the same container, as long as the container is big enough to support two plants. Good luck! i am subhash from india, i have planted strawbery plant in a container last year once it has olready fruited and this year i saw that about twenty to twenty five runners came out and out of that i have planted fifteen new plant so i want to ask that the mother will get harm due to more runners or it will fruit this year also. and another thing will i have to change the soil of the mother plant or continue with the same, so kindly gide me. waiting for reply. The mother plant should do just fine this year. You might want to add some fertilizer to the potted mother plant this year. I’d recommend reading the material on the Growing Strawberries reference page. It should help. Good luck!